Prague Castle holds a number of records. First of all, it is the largest castle in the world, entered in the Guinness Book of Records. It is also the most visited Czech monument among tourists. It is the most important of Czech castles, because from time immemorial it has been the residence of sovereigns, and currently the President. It is also undoubtedly the most beautiful castle in the Czech Republic. 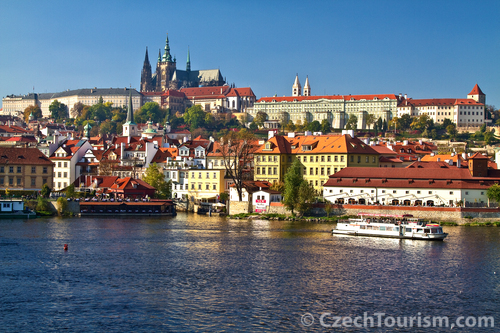 Prague Castle is unparalleled in the Czech Republic in all respects and visiting it is a 'duty' for all tourists. Prague Castle was founded in 870 by Prince Bořivoj of the Přemyslid dynasty. Its appearance has changed many times since this period of wooden palisades. The castle has grown, with major reconstruction taking place particularly during Charles IV's reign, when construction of St. Vitus' Cathedral, which was to become a dominating feature of Prague, also began (although it was not completed until the 20th century). The cathedral was also a place for Czech kings to take time out, including the Czech patron saint, St. Wenceslas. The cathedral was also the location for royal coronations. The last major work to be carried out took place just after the independent Czechoslovakian state was founded. It was undertaken by the world-renowned architect, Josip Plečnik, under the auspices of the first president, T G Masaryk. Prague Castle is today a complex of buildings with examples of virtually all architectural styles from the preceding millennium. It is impossible to see all of Prague Castle in one day. There are a number of tours available which you can visit and there are also a number of permanent and temporary exhibitions to be found, mainly devoted to art. There are a further three churches in addition to the cathedral. The most interesting of them is St. George's Basilica dating back to 920, which has preserved its original Romanesque character. It is a part of St. George's Convent, which was founded half a century later. The convent now houses a National Gallery exhibition about 19th century Czech art. The Emperor Rudolph II's Imperial Stables were converted for exhibition use in the 20th century and are nowadays one of the most modern galleries in the Czech Republic. Prestigious temporary exhibitions take place here. The most romantic place in Prague Castle, and possibly the whole of Prague, is the Golden Lane where Emperor Rudolph II's alchemists used to live. Not so long ago, the writer Franz Kafka lived and wrote here. Craftspeople and artists have today returned to the lane, where you can look at and buy their products. Works of art from famed collections of Emperor Rudolph II, who was a passionate art collector, are exhibited in the picture gallery. Works from Titian, von Aachen and Rubens are included in the gallery. More than 100 paintings from a total number of 4,000 pictures can be found here. The picture gallery is located in the castle's second courtyard. The Powder Tower, which used to serve defensive purposes, containing cannons, was an alchemy laboratory under Rudolph II. Today you can find a permanent exhibition dedicated to the Palace Guard here. You will be sure to notice the Palace Guards on entering the castle. The changing of the guards, a great tourist attraction, takes place every hour. Every day at noon a changing of the guards with full pomp and a military parade is held. The Story of Prague Castle is a permanent exhibition which takes you century by century through the whole history of the castle and the Czech lands. The exhibition can be found on the Gothic floor of the Old Royal Palace, which can be entered from the 3rd Courtyard to the right of St. Vitus' Cathedral. Prague Castle's Baroque Riding School has long not been used for horse riding. It is currently the largest exhibition area in the Czech Republic and a number of interesting exhibitions are held here every year. The Summer Palace is the most distant castle palace. Ferdinand I had it built in the 16th century for his wife on the eastern edge of the Royal Garden. The Summer Palace is one of the most beautiful examples of Renaissance architecture in Central Europe. You are only able to look inside when one of its many exhibitions are taking place. If you go to the Summer Palace, you will notice the bronze Singing Fountain. It got its name because if you put your ear to the bottom of the bowl, you can hear the note 'a'. The sound is also reminiscent of the distant ringing of bells.